One of the most common questions when buying a larger bed is whether to go for the standard or California King size. There can be some confusion about the differences between them, and there are advantages and drawbacks to both. California Kings are generally thought of as a more specialized bed. They’re less commonly manufactured and bought, which can make buying bed accessories (particularly bedsheets) for them challenging. One frequently asked question is whether the bedsheets of a King can fit a California King – and the answer is not as straightforward as one might think. What’s a King Size Bed? A King size bed (also known as an Eastern King) is 76 inches wide by 80 inches long – both wider and shorter than a California King. It’s ideal for those who like a lot of sleeping space, or those with kids or pets who visit the bed too. 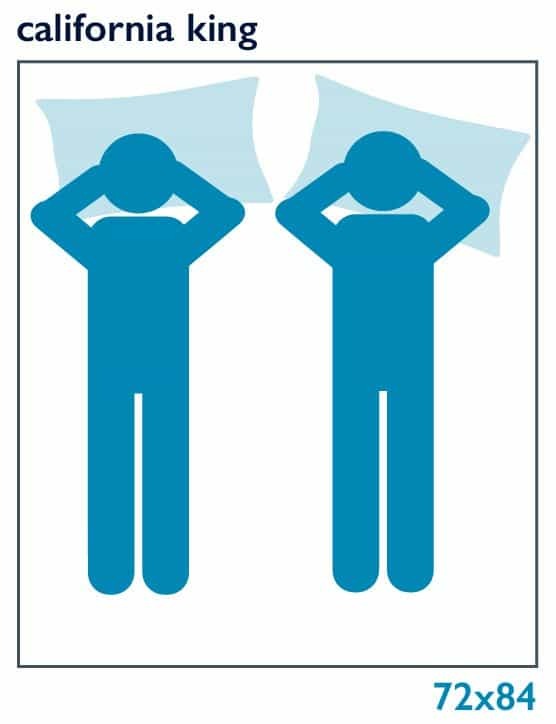 A King sized bed gives the equivalent sleeping room of two twins, and is the best bed size for horizontal space. 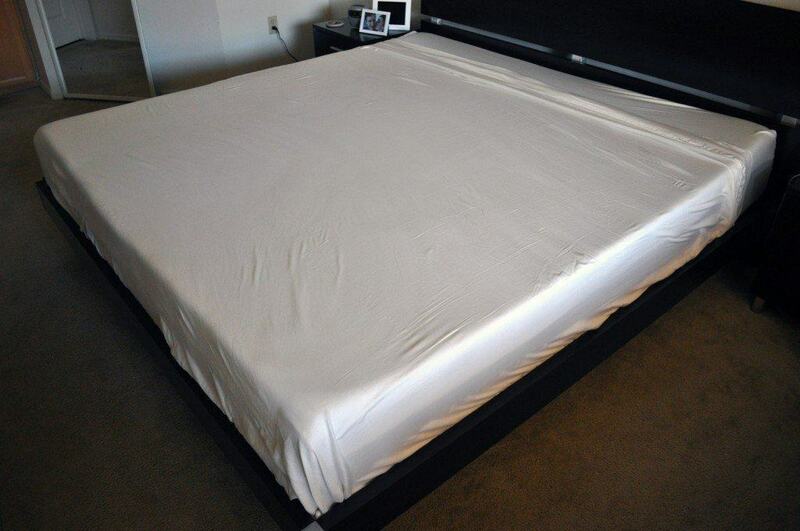 A fitted sheet for a king size bed is typically 76” × 80” × 15”, and a flat sheet is 110” × 114”. California Kings (also called Western Kings) are the longest beds on the market, designed especially with very tall sleepers in mind. They’re 72 inches wide by 84 inches long, making them 4 inches longer and 4 inches narrower than a standard King size bed. 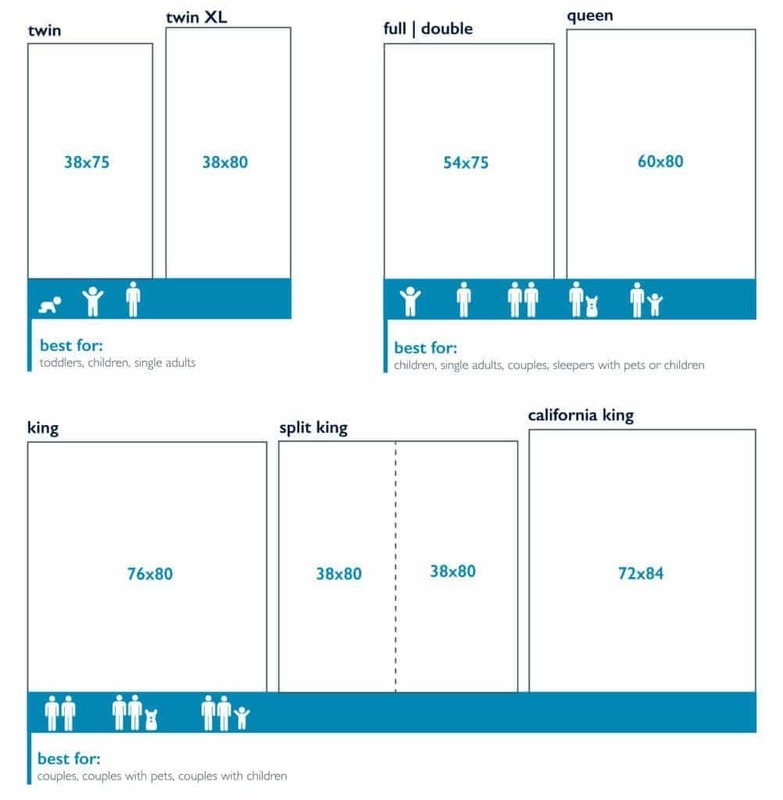 Although this comparison can make the California King sound narrow, it’s actually 12 inches wider than a Queen size – undeniably still a sizeable bed. 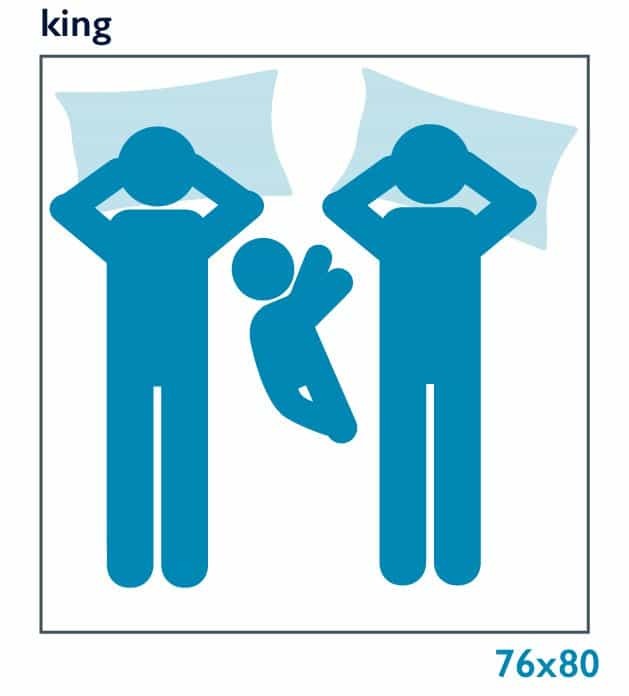 A fitted sheet for a California King is 73” × 85” × 15”, while a flat sheet is 111” × 114”. Because the California King is the longest mattress size on the market, many assume they’re the biggest. But the California King is actually smaller in width than the standard King. It also has less overall surface area than a standard King. It’s more of a specialized mattress, particularly for those who are very tall or who have a long and narrow bedroom space. For those simply wanting a really big bed, the King may be the one to go for. What Are The Reasons For Choosing Either? If you’re tall, the California King seems an obvious choice, simply for that extra length. It’s ideal for those who find their feet hanging off the end of other beds. Those over 6 foot will probably find it more comfortable, and those over about 6 foot 3 may need a California King in order to comfortably fit into their bed. Another good way to decide between a King and California King is by checking the dimensions of your room. If you’re trying to fit a bed in a particular space, check which size will be better suited. One can look more aesthetically pleasing than the other in a certain space, too. The main area of difference between the two, though, is the ease and availability of finding appropriate bedsheets, along with other bed accessories like comforters and headboards. King Size sheets are easily accessible, but this is not always the case with the California King. One of the biggest drawbacks of the California King is that it can be difficult to find bedsheets and bed accessories that fit. While King sized sheets are fairly ubiquitous in department stores, California King sheets are more difficult to come by. Sometimes you can find specialty sheets by contacting a company whose sheets you already know and like. Another option is to get California King bedsheets specially made. In the internet age, acquiring California King sheets has become much easier, too. Fitted sheets are unlikely to be able to transition between a King and California King sized bed. Sometimes they can be made to just about fit, but the frustration of the corners constantly popping out may be difficult to deal with. One tip to make a fitted King bedsheet work on a California King bed is to turn it sideways. Although it’s not a perfect fit, these dimensions are closer and the fit will be slightly better. However, you may have more luck with unfitted sheets. Although the unfitted, non-elastic-cornered King sheets may not be the ideal size for the California King size bed, they’re a useful tip for those really struggling to find California King sheets. In a pinch, they can certainly do the job. There are also some companies who produce something called a King Size Flat Sheet, which incorporates the largest dimensions of both King and California King, making them 102 inches by 108 inches. These sheets are interchangeable between the King and California King. There also exist options for “oversized King” comforter and bedcovers, which will easily work on the California King. There are a variety of ways to get sheets that fit a California King bed. But it’s worth remembering that getting bedsheets for it is not always easy, can be expensive, and may mean you have to settle for a slightly imperfect fit. Generally speaking, unless you have a specific need for a California King, it’s recommended to go for a King. A King Size bed is better suited to more common wants (more sleeping space) and needs (room for visitors of the child and pet variety) of the average large bed customer. However, for those taller than six foot (and even more so for those way over), The California King is likely to be a more comfortable choice. If the sheets issue really bothers you, we have a comprehensive list of sheets available in the California King size, so you no longer need to let it put you off. For sheets that can fit both sizes, one of our tops picks are the Purple Sheets. Their King / California King Size is a bargain at $129, and perfect for those who want cool, breathable, lightweight bamboo sheets at great value. If it’s Tencel you want, Malouf do great quality sheets up to a California King size, which are soft, cool, and affordable at $167.99. Because they’re Tencel, they’re also eco-friendly. For a cotton sheet suitable for a California King, we recommend the Naturepedic Organic. As you’d expect from high quality cotton, they’re extremely breathable and durable, and thanks to their organic construction, they’re healthy and eco-friendly, too. The California King sheet costs $259.